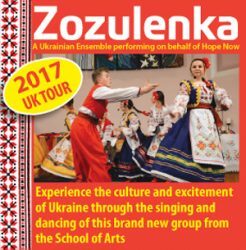 Zozulenka, a Ukrainian Ensemble, will be performing at CBC at 7pm on Sunday 29th October 2017. This is a singing and dancing group of young people. They perform traditional songs from Ukrainian culture together with some well-known English songs, on behalf of Hope Now, a charity which has been working in the Ukraine since 1992.